We’ve heard your feedback, and in the next few weeks, we’ll be rolling out a new look and feel for the JW Player dashboard. Over the past few months, we’ve been looking at how our customers are using the JW Player dashboard and reaching out directly about what they like today, and what they would love to see in the future. So, in a few weeks, we’ll be rolling out a new, sleek design that not only looks great but will also make the JW dashboard even easier to use. We’ve put the button to upload a video front and center to make it easier for new users to find. We have also renamed a few things to make it more intuitive for anyone to use the dashboard without a tutorial! 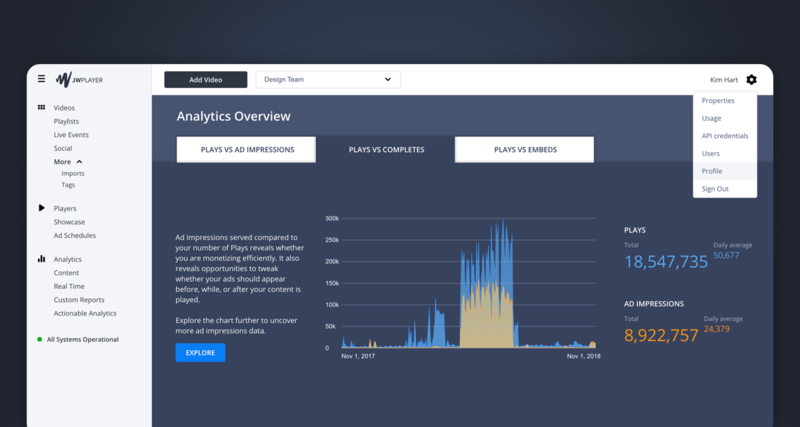 "Overview" is now called "Analytics"
"Right Now" is now called "Real Time"
Don’t worry – we’ll have handy instructions on where everything lives in the dashboard when we roll this out, so you don’t miss a beat with this new design. In the meantime, if you have any questions don’t hesitate to reach out – you can always get ahold of us here or reach out to your Account Manager.